DANZKA Vodka has gained expanded listings throughout Latin America this summer. The premium Danish vodka producer owned by Waldemar Behn is also holding tastings and introducing its new super premium THE SPIRIT variant to the region. 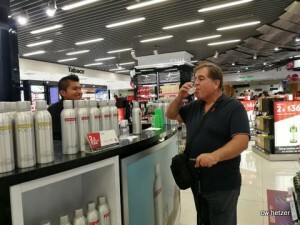 DANZKA Vodka has been listed in Lima’s Jorge Chavez Airport, where it held tastings with Dufry in May. “As part of our strategy in South America, we recently launched DANZKA in Lima Airport with Dufry, giving more exposure to the brand, both, on the local market as well as the travel retail segment,” says Waldemar Behn’s Americas Regional Director Tito Gonzalez. Gonzalez tells TMI that the tastings are the latest step in DANZKA’s long history in Peru, where it has been available since the late 1990’s. “DANZKA was one of the first premium vodka brands in the region, so it is well known in Peru. By expanding our distribution, we continue to develop the brand throughout the region, both domestic as well as Travel Retail. DANZKA Vodka conducted tastings at Lima Airport in May. “We will continue to grow our presence in the different airports in South America with our DANZKA Original and DANZKA Flavors. We are only focusing on a few of the most important vodka markets where we are exploring opportunities for local and domestic distribution. You will continue to read more about DANZKA and the Americas in the coming months. This is all very exciting,” he says. DANZKA THE SPIRIT is also expanding in the region, following its launch in North America last year, and is now being sold in Brazil and Argentina, and in other locations throughout the Americas. “DANZKA THE SPIRIT is now available at Sao Paulo, Rio de Janeiro and Ezeiza airports. Our Traveller’s Exclusive – Premium Superior Vodka has arrived to the Southern Cone. After a successful launch in Europe, America couldn’t wait to get this product on the shelf,” says Gonzalez. “THE SPIRIT has also arrived in Mexico City, Cancun, and Puerto Vallarta, as well as in Ocho Rios, Jamaica, Puerto Plata in Dominican Republic, and Aruba,” says Gonzalez. THE SPIRIT is also available in travel retail in Houston, Las Vegas, Newark, and Chicago in the United States.